I'm Here. I'm Queer. What the Hell do I read? : I'm a 'Volunteer In The Spotlight!' SCBWI's Los Angeles Newsletter, Kite Tales, Features Me & My Schmooze Co-Coordinator Rita Crayon Huang! I'm a 'Volunteer In The Spotlight!' 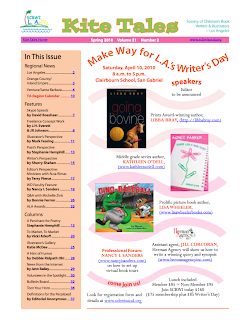 SCBWI's Los Angeles Newsletter, Kite Tales, Features Me & My Schmooze Co-Coordinator Rita Crayon Huang! Volunteering as the Society of Children's Books Writers and Illustrators Los Angeles Westside Writers Schmooze Co-Coordinator has been - and continues to be - a wonderful experience. My thanks to Rilla Jaggia and everyone at Kite Tales for the honor, and of course to my wonderful co-honoree (and friend), Rita! Oh, and if you want to check out what we've been up to for the last 14 months, check out our schmooze blog posts here!